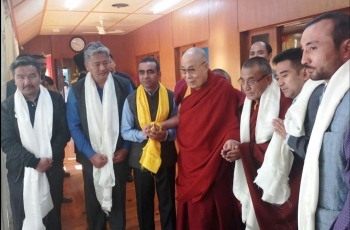 To request His Holiness Dalai Lama to visit Ladakh in the summer month, a delegation of Ladakh Buddhist Association (LBA) and All Ladakh Gonpa Association (LGA) met His Holiness on March 7 at Dharamsala, Himachal Pradesh. The delegation was led by Tsewang Thinles, President, LBA, Ven. Shedup Chamba, President, LGA, PT Kunzang and Rinchen Namgyal, Vice Presidents, LBA, Sonam Dawa, General Secretary and Lobzang Stanba, CWC member. His Holiness Dalai Lama assured that he will try his best to visit Ladakh.